Augusta is a town on the south-west coast of Western Australia, where the Blackwood River emerges into Flinders Bay. It is the nearest town to Cape Leeuwin, on the furthest southwest corner of the Australian continent. In the it had a population of 1,091; by 2011 the population of the town was 1,292 (excluding East Augusta).The town is within the Shire of Augusta-Margaret River local government area, and is in the Leeuwin Ward. It is connected by public transport to Perth via Transwa coach service SW1.Augusta was a summer holiday town for many during most of the twentieth century, but late in the 1990s many people chose to retire to the region for its cooler weather. As a consequence of this and rising land values in the Augusta-Margaret River area, the region has experienced significant social change.HistoryThe coastline near the Augusta area was first sighted by Europeans in March 1622 when the Dutch East India Company ship Leeuwin (Lioness) mapped and named the land north of Cape Leeuwin between Hamelin Bay and Point D'Entrecasteaux 't Landt van de Leeuwin. 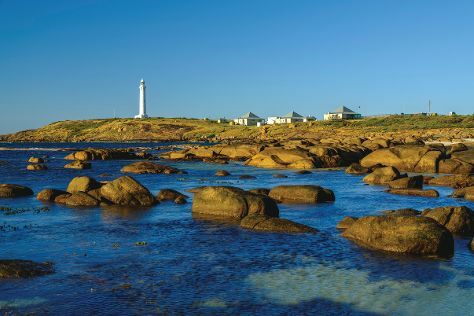 In 1801 Captain Matthew Flinders named the "south-western, and most projecting part of Leeuwin's Land" Cape Leeuwin. Augusta is in Margaret River Region. Put Augusta at the heart of your travel plans by using our Australia route app .